I’ve been using Twitter for more than a few months now and up until recently I’d never done anything to really enhance my use of it. I recently found out about a Firefox add-on called ‘Power Twitter‘ and I really like it. One of the things that used to annoy me about Twitter was that the links to images and webpages were always in a tiny.url form, or in a form that was so early web days (a ‘naked URL, not a link behind words) and didn’t mean anything. Power Twitter adds this functionality. (Click on any image below to view larger one). It also shows images, rather than links to images which I just love because I’d rather see it all in the one application rather than have to open another application. To tell the truth, I usually didn’t click on image links and it took me ages to learn about this thing called Twitpic. 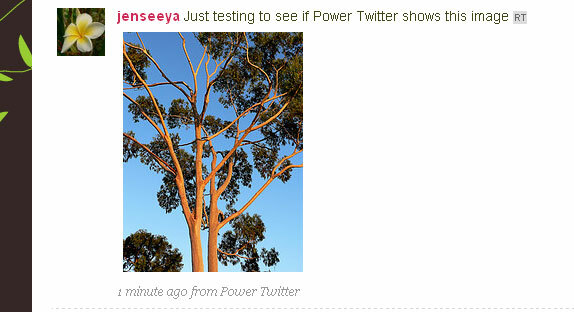 Apparently it will show Flickr, Twitpic and Youtube links inline within Twitter. There is also an inbuilt Twitter search function. It doesn’t show trending topics like search.twitter.com does but you can search for anything you want. It’s very handy. Another handy little feature (you can see why they called it Power Twitter) is hover over people’s avatars and it shows their latest status updates. The only drawback – and it’s only a very small drawback – is that it takes that little bit longer to load. Twitter loads as normal, then Power Twitter kicks in. It doesn’t bother me at all. All in all I like having Power Twitter in my Twitter life. What makes your Twitter life easier? What makes my Twitter Life easier is going absolute minimalist. I use Pidgin as my IM client and it allows me to connect to a variety of IM’s like MSN, Yahoo and AIM. What I also like about it is that there is a plugin written for Pidgin which allows me to view and reply to Twitter posts. Since it’s an instant message window/tab, I don’t always have to have my Twitter open on my browser all the time and it updates as it goes along. The only downside to it is that there is no dedicated page for Direct Messages and Replies. 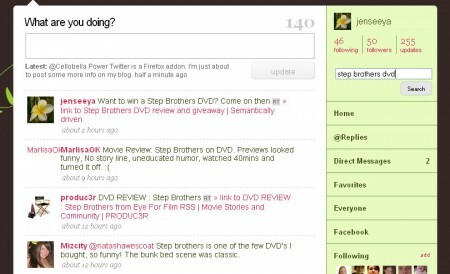 That I have to go to my Twitter page to view all the @ replies. But also since there is no limit to how many twits you can view in the Pidgin window, I can see all recent replies fine. Sigh. It’s just that I can’t be bothered downloading Firefox. Edrei, there’s obviously a lot more ways than I ever realised to engage with Twitter and the like. If I used IM a lot then this sounds really good but I’ll probably stick with Twitter for now. 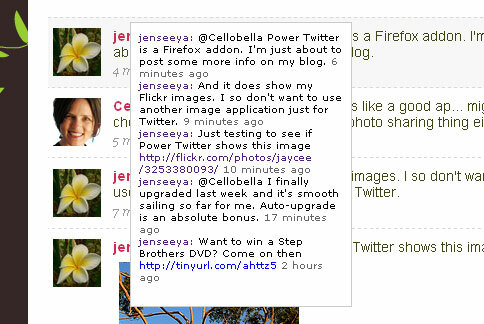 Cellobella, I’d recommend using Firefox. I’m a convert, although I still use IE at work because that’s what gets installed so we have to cater for it also. Interestingly most people view my blog with Firefox. Ahh, I’ve just started using Twitter and have d/l TweetDeck, which isn’t too shabby lol. Jayne, I’ve heard about Tweetdeck but that’s about it. I need more of an indepth look though. Great Kikolani. Glad you like!